The weekly operational meeting is an absolute information and innovation machine – the most valuable time for your restaurant in the whole week. It is a time devoted to the issues surrounding how your business can increase its sales and profits and expand. It is the stage from which you provide direction to your staff, and the training ground for your managers to run the business in your absence. Or, at least, that’s how it should be – and can be – with a little organization and planning. Run correctly, the weekly operations meeting engages your entire team in plans to improve sales, service, guest and employee satisfaction levels. If the meeting agenda is weak, or the leader is unprepared, however, the time will be used poorly. It may even be counterproductive, becoming a drain on managers, who will become bored, complacent and wonder why they have to come in early to listen to a lecture. This lack of motivation and inspiration will be reflected in poor results in the dining room and bar. 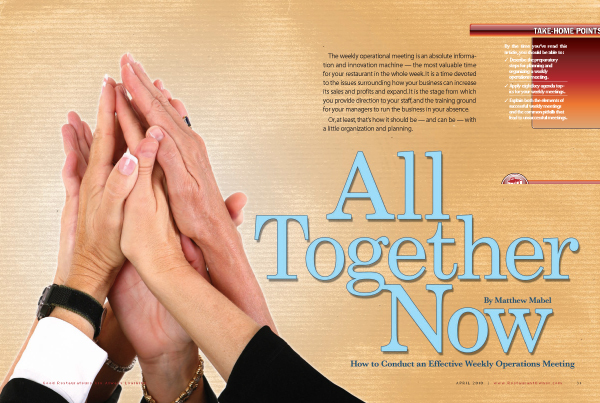 Begin by preparing a standard, recurring agenda that covers general business topics to discuss every week. Change the content of each topic depending on what is going on in your restaurant. Start with a global message, move on to weekly numbers, and share the efforts of each manager and successes and failures with guests. These first four topics should become a weekly shared overview of the state of your restaurant. Then, go into a more detailed look with the fifth topic. Pick a weekly time for the meeting and a length – around 60-90 minutes. Most operators don’t have weekly numbers until the end of the day on Monday, so they schedule the meeting after those numbers are available for discussion – typically a Tuesday, Wednesday or Thursday afternoon between lunch and dinner service. Include all management personnel, front and back of house, and consider asking shift leaders and department heads to also join in. Try and find a day when no managers have a day off. No one wants to have to come in on their day off for a meeting – no matter how valuable it becomes. And make sure you aren’t disturbed. If the restaurant is open all day, designate a head server or bartender to be in charge of the floor during the meeting to eliminate potential interruptions. Also, designate a secretary for each meeting to take notes of what is discussed. This is an important step toward creating accountability. The meeting’s chairman gets to speak out on a topic he or she feels is especially important to the group and to the success of the restaurant. This topic should be approved in advance by the general manager or owner of the restaurant. Recap the metrics of the previous week to establish a baseline of where things stand – revealing the restaurant’s big picture. Include sales for the past week. Compare them with the forecast and with the equivalent week last year. Illustrate per-person check average by meal period in comparison with goal. Identify food cost, beverage cost and labor cost for the prior week, and compare these numbers with historical performance and forecast. If the restaurant has a service measurement system, or mystery shopping data and scores from the prior week, be ready to review the latest information. Discuss and establish action items related to these numbers to be completed by the next week. Assign people to act on these items. Review the action items from the previous week. Great restaurant managers contribute more than shifts that run smoothly. They lead initiatives, projects and pilot programs – the things that have been discussed in the previous managers’ meetings. The two-minute drill illustrates anecdotal evidence about one of the most valuable things any restaurant can have: a management team devoted to constant improvement. In the two-minute drill, each team member talks about what they have been working on in the past week to advance the business and culture of the restaurant – beyond running their shifts. You can imagine that, when managers know they have to attend every week and tell their peers about their activities that are contributing to the success of the group, no one will want to feel they are letting the team down by showing up without an impressive answer. Each manager is responsible for sharing two stories: one detailing the best thing that happened to a guest in the past week, and one detailing the worst. Often the “worst” story turns into the “best” story – a tale of a manager intervening with an unsatisfied guest who ends up walking out happy. If there is a particular cultural aspect to the restaurant that goes beyond customer service, like guest recognition, staff happiness or uniqueness, substitute that, or add that to customer service in the “best and worst” category. What evolves from week to week is an archive of both outstanding, pride-inducing events of customer service and inglorious, eye-rolling, gut-wrenching and, admittedly, sometimes funny failures that keep a team humble. There are four main reasons for discussing best and worst. First management teams are often focused on solving problems, so it feels good to take time to brag about victories in the dining room and bar. Second, it is important to know that if a management team is having a hard time coming up with outstanding stories about service, there is a good chance that they are not executing very well. Every great restaurant should have an abundance of outstanding “best” stories. Third, restaurants are operated by human beings, who are going to make mistakes, so balancing that with a “worst” story focuses managers on the need to be ever-vigilant, and continue to perfect the hiring and training process. Fourth, discussing this every week keeps managers focused. They know they have to show up at the weekly meeting with two stories. The focus on customer service increases. At this point of the meeting, information about the status of operations has been shared. Now it’s time to go into detail. Customize the standard agenda to include topics that are important to the operation, such as catering, food and beverage, personnel, marketing, repairs and maintenance, and training. Discuss the status of each, and review the results of the action items assigned to specific managers from the previous week’s meeting – things that were to be completed in one week. Then, develop agreement on what happens next and assign action items to specific managers. No one wants to come to the meeting to announce that they have failed to accomplish what they committed to during the previous meeting. By fostering a cycle of commitments that are to be met each week, restaurants ingrain accountability, achievement and process improvement. To respect all participants’ time, make sure to only discuss global issues that affect the whole team. Conversations about minutiae that do not affect the group can take place after the meeting between the appropriate managers. This is a chance for any participant to bring up an issue they feel has been overlooked. This helps prevent an important perspective from being left out or a manager from feeling they have been marginalized. If you are prepared to discuss an unanticipated topic when it is brought up, great. If not, commit to putting it on the agenda for the next weekly operations meeting. As the meeting winds down, review all of the action steps and commitments that have been made during the meeting. Have the secretary write them down and publish them through a group e-mail, shared document on a network, or password-protected Web site. At the end of each meeting, announce the chairperson for the next meeting. He or she will be responsible for preparing the next week’s agenda. Though all participants will eventually chair the meeting, it may be best – in the beginning – for an owner or general manager to run the meeting until it goes smoothly. After a while, though, the meeting, with its recurring topics, tends to run itself. All it needs is a referee. As the chairmanship rotates, start with the managers who will be strongest at leading the meeting, keeping it moving and cutting off discussions that become extended and pointless. The others will learn from these examples before it is their turn. If certain future meeting chairmen need coaching before their chairmanship and a specific performance review afterward, provide that. Here is my prediction based on experience. Team members who have the honor and respect of chairing a meeting will develop a thoughtful, significant message that reflects what is important to the company from their perspective. Many leaders are initially resistant to pass the gavel to each member of their management team. If you share those feelings, consider that a management team is most successful when everyone understands their power to contribute to the evolution of a restaurant. One of the most powerful examples of this occurs when it is the turn of a junior manager to run the meeting. This reinforces the fact that, for them, anything is possible. They realize that they are at the head of the table – capable of being temporarily in charge of a group that includes their owner or general manager. They will experience a feeling that at first may be nerve-wracking, but will eventually be exhilarating. This will lead to a boost in self-image. Power and responsibility will be spread throughout the management team, illustrating teamwork and the importance of each individual. Only good things can come for a restaurant when every member of the management team realizes that they are important, and that each and every member of the team is responsible for contributing to the improvement of your restaurant beyond the running of shifts. That is why it is very powerful to rotate the chairman’s duties. First, cancel the lecture series. That’s not what these meetings are for. You probably aren’t rich enough to afford managers who do not participate and share in improving your restaurant. Make sure each participant speaks. To develop confidence and build professionalism and self-image, release some topics in advance so participants can think them through. Reveal other topics on the spot to get the first impressions of the participants. The chairman should direct discussions that go around the table and ask each participant to state their opinion on a topic before a general discussion begins. Expect the chairman to recognize people who want to contribute, but also to call on people who may be reticent. It may just be their personality to be quiet – not an indication of a lack of knowledge, ideas or perspective. This is a management team meeting, so let the team have the floor. At the beginning of this process, owners and general managers should not talk more than 50 percent of the time – even less as the process continues. As time goes on, the best meetings feature less and less talk from the chairman, owner or general manager and more from management team members. As a result, the meeting will become symbolic of a powerful management team in which everyone contributes. Wherever possible, let the participants – not the chairman, owner or general manager – present topics, especially the ones they themselves have contributed to the agenda. Give them a featured slot early in the agenda to show that they are important, instead of giving them whatever time is left over once the boss is finished talking. Initiate pilot programs in place of endless debate. “Let’s try it,” is easier for people to hear than, “Let’s change everything.” Set a deadline for evaluation of the pilot program and connect that deadline to an agenda item in a future meeting. Stretch to go beyond what people expect. We’ve all been to a lot of meetings. Can you imagine yourself there, hearing something fresh and new? When leading a meeting, always be looking for material. I have seen Mike Cole, operations director at the 10-unit i Fratelli Pizza in North Texas, lead a managers meeting by quoting U.S. presidents and other historical figures to illustrate a point. At the airport in Tulsa, Oklahoma, I met a cabdriver named Nader who considered himself an entrepreneur running a business – not just a cabdriver. I used that as material to inspire a group of restaurant managers. One group of managers I met with had the habit of blaming employees instead of taking responsibility for their restaurant. I passed out hand mirrors for everyone to use when they had a complaint, so they could look at themselves. This underlined that developing answers and solutions are the responsibilities of managers. Stay alert to different ways of presenting a theme. Make people think and talk about the unexpected to make your point. Material is everywhere. Returning from a trip to Orlando, Florida, I met with a management team that was feeling they were up against some very challenging issues. I told them about my trip, and pointed out that if Disney could turn a swamp into a top tourist destination in America, a group of restaurant managers could probably conquer their operational issues. Measurement is extremely important. Hold people accountable with specific goals and results that can be measured. Something either happened or it didn’t. A metric was either achieved or it wasn’t. Never leave a meeting agreeing on something that cannot be related to a benefit to the business and measured – preferably with a progress report at the next meeting. This also reinforces your desire to waste no manager’s time attending unimportant and meaningless meetings. When you set up this meeting system, you will gain more than a valuable weekly forum where your management team comes together. You will also reinforce teamwork, measurement, accountability, participation, action, and important and timely contributions from each manager. Managers will get the message that managing a restaurant is a constant process of improvement – more than just running shifts. Practicing this is the best way to grow your restaurant and your company. Do this every week, and things will really start to move. What you had thought was impossible will start to happen. 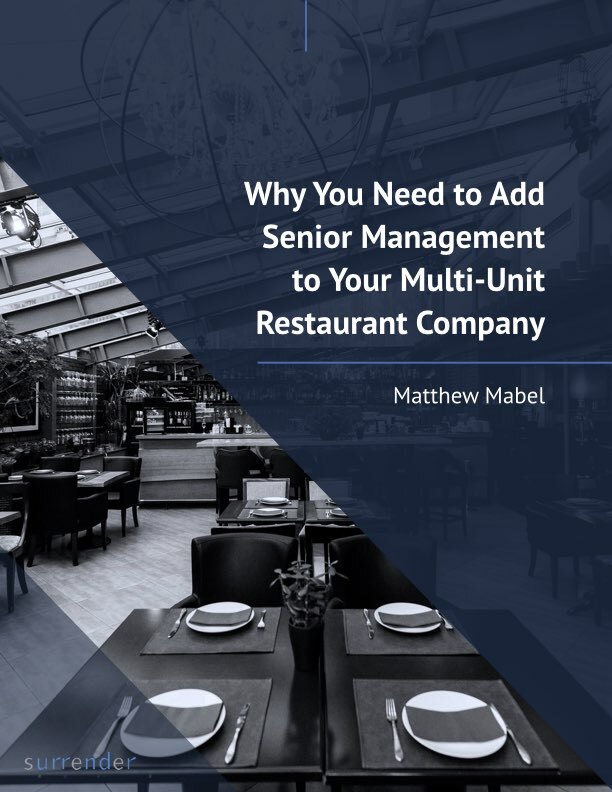 — Matthew Mabel is President of Dallas based hospitality and management consulting firm Surrender, Inc, serving growing restaurant companies since 1991.